You made it through the refinishing process. Please wait a minimum of 48 hours before placing furniture back onto the floor. If you are putting a large area rug down, wait a week to allow the floor to cure properly. 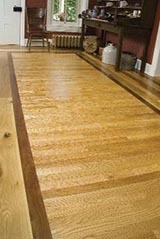 Now it's time to educate yourself (or your cleaning lady) on the proper care of your wood floors. Taking care of wood floors is a lot like raising children - everybody has a different opinion. That's because not all wood floors are the same. Different finishes require different methods. Your floors have been finished with either an oil-base or an oil-modified finish. 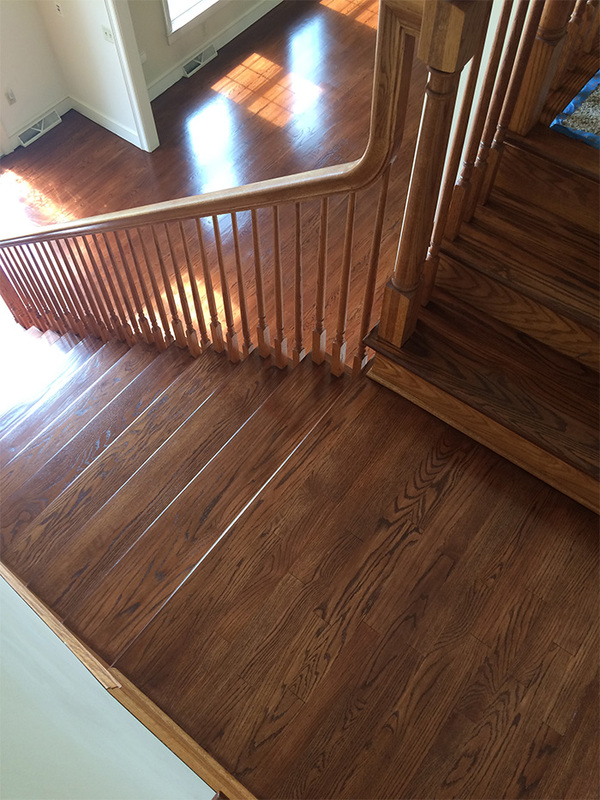 This type of polyurethane is the most durable and practical product for your home or office. Taken care of properly, it will last a lifetime. This page was designed to give you basic guidelines on how to clean and maintain your hardwood floors and protect your investment. 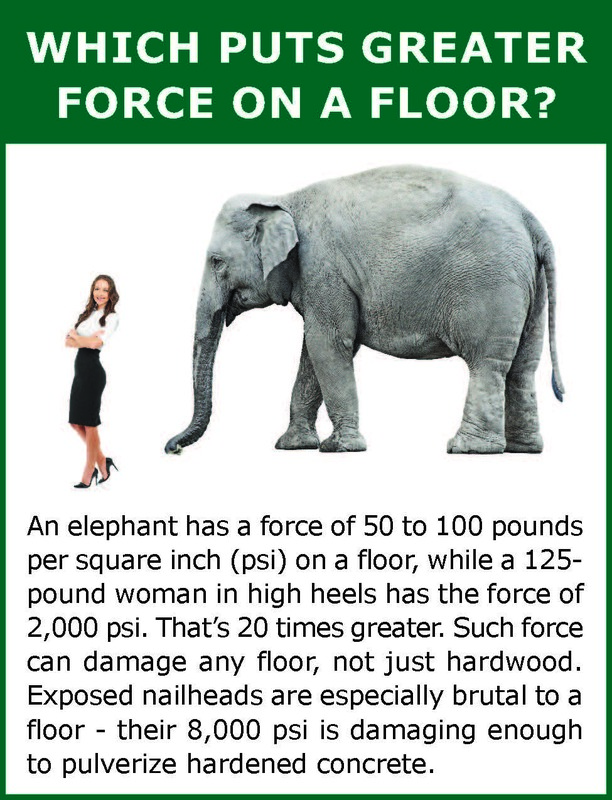 If you have any questions about something that is not addressed here, please feel free to contact Galebach's Floor Finishing, Inc. at 717-898-9680 and we will be happy to answer your questions. 2 to 3 Times per Week: Dry mop, dry Swiffer or vacuum. The more that dirt and grit are allowed to accumulate, the more they will be tracked over the floor leaving scratches. Clean floors before and after major events. 1 to 2 Times per Month for high traffic areas or 1 Time Every 3 Months for low traffic areas: Vacuum area first. Mix up cleaning solution in bucket. Fill canister on spray mop. 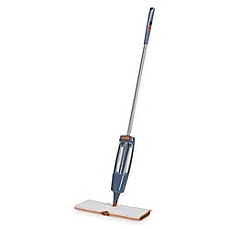 Have a dry mop on hand if you are going to dry the floor as you go to speed up the process. Mop floor going with the grain of the wood. Do the section farthest away from your exit doorway first. Continue to spray mop and dry in sections as you work your way out of the room. Do not walk on the floor while wet. Too much water is wood's worst enemy. Be careful not to get them too wet. Steam Mops: No matter what you have seen on TV, these are bad for hardwood floors. Ammonia: Like pet urine, this will make the wood black and will cause stains that will not sand out. Orange Glo: This product will build up a hazy finish because it contains wax. Murphy's Oil Soap: Good for cabinets and furniture, but not floors. Most manufacturers will void any type of warranty when this product is used. Pledge or Endust: These products contain wax and will make your floors dangerously slippery. Do not try to bleach any pet stains - they will turn pink. Pet stains may lighten with sanding, but not disappear. Sanding takes 1/16" to 1/8" off the top but stains are usually deeper than this. Board replacement is usually the fix. Use area rugs and floor mats at entrance and high traffic areas. Also, in front of sinks, stoves or refrigerators where water may accumulate. Rug backing should be a natural fiber. Rubber backed mats or pads will negatively affect the finish over time as they dry out and get brittle. If you use them, replace them every few years with new pliable pads. Use felt floor protectors on the bottom of anything that moves on your wood floors - mostly chairs and stools. Replace them as they wear or fall off. Super Glue is a good adhesive. Keep pets' nails trimmed and put throw rugs where they jump around (usually when someone rings the doorbell at my house!). Do not keep water dishes for pets directly on the wood floor. Keep temperature and humidity within normal living conditions. Extremes of either will cause cupping or buckling. 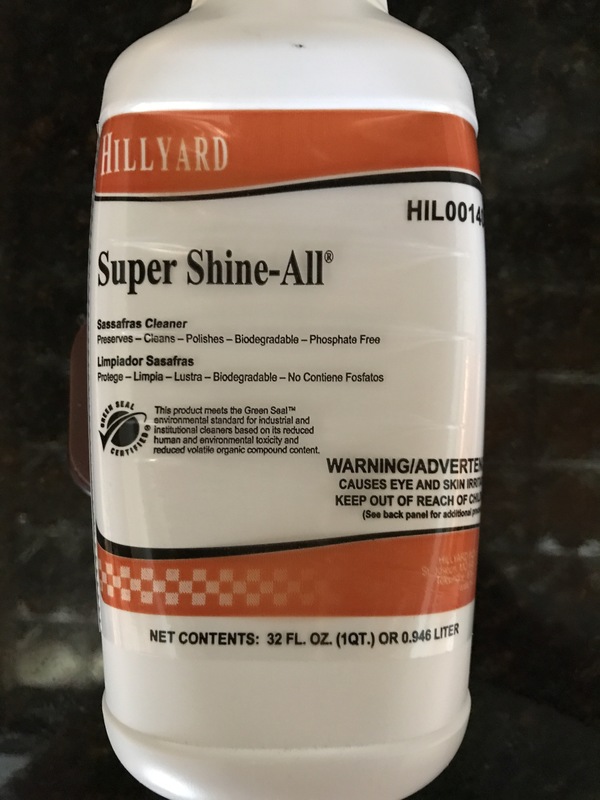 Super Shine-All is a good wood floor cleaner that meets the Green Seal standard. Use 1 oz to 1 gallon of water for light mopping or 3 oz to 1 gallon for normal damp mopping. It can be purchased at Hillyard, 260 Steel Way, Lancaster. 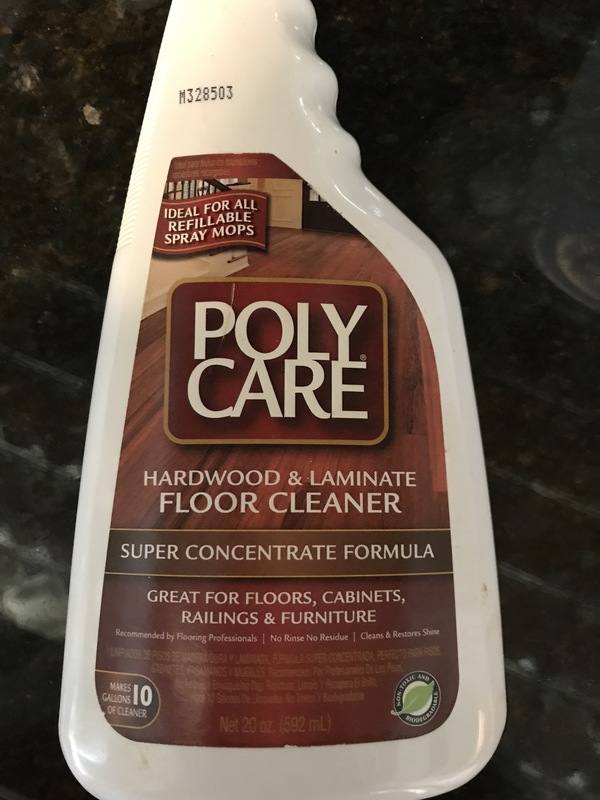 Polycare is another good product. Use 1/4 cup to 1 gallon of water. Polycare can be purchased online or at Bed, Bath and Beyond. White Vinegar can be used if you run out of other cleaners. 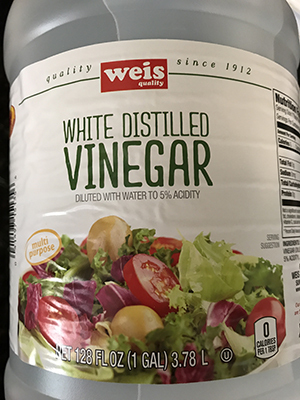 Use 1/2 cup white vinegar to 1 gallon of water. 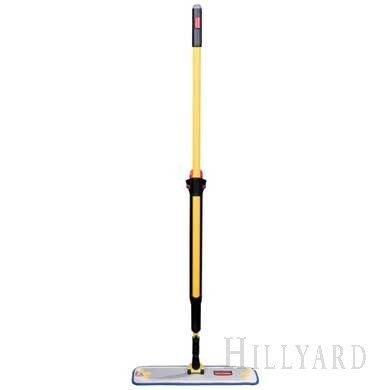 Rubbermaid Pulse Mop (left photo) can be purchased at Hillyard (see address above). Casabella XL Quick Scrub Spray Mop can be purchased online or at Target, Walmart or Bed, Bath and Beyond. Both of these mops have microfiber pads that are detachable and can be laundered. 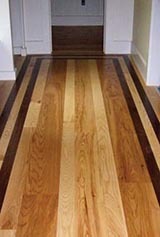 Wood floors usually have about four sandings in them if they are 3/4" thick. So it is best to maintain them as much as possible so that they do not need to be sanded very often. To do this, follow the cleaning instructions detailed here. Every 7 to 10 years, you can then have your floors professionally buffed/cleaned and recoated with another layer of finish to keep the wood protected. This is not a dusty process but does involve clearing the furniture out of the room and staying off the floors overnight. You will receive a reminder postcard from us when you are nearing your 7 years.